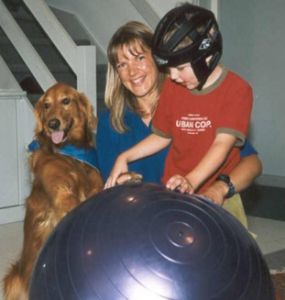 In 2007 Animal Companions took part in a pilot research project with Princess Margaret Hospital exploring the impact of Animal Assisted Therapy (AAT) on the rehabilitation of children with acquired brain injury. Four therapy dog teams were selected for the project and three teams participated. Each dog and handler was present at treatment sessions with a child with acquired brain injury, alternating 3 weeks present and 3 weeks absent from the sessions. Objective measures were taken during each treatment, including physical changes in the child, salivary cortisol measures, and interviews conducted with those involved. The results of this small project showed no statistical evidence that the AAT intervention impacted either positively or negatively on the treatment of the brain injured children. However, the interview feedback from those involved showed that the children, their parents and the staff all enjoyed the experience more when the dogs were present during therapy sessions.